Well, this is a thrill. 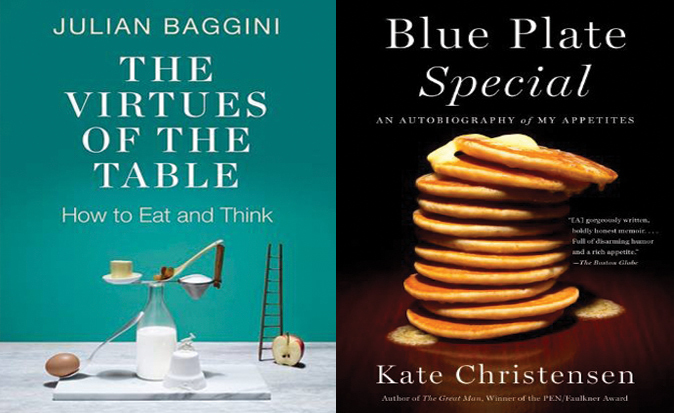 I don’t usually get to write about my favourite cookbooks of the year – nobody asks me – despite the fact that they’re a huge love. 2014 is a good year to do my first round up, though, as it’s been an absolutely bumper twelve months. There were a few titles I could hardly wait for – Honey & Co (the book of the lovely Middle Eastern restaurant in central London) was on my list as soon as I heard it had been commissioned. And at last Gabrielle Hamilton was persuaded to write a cookbook of the dishes served at her New York restaurant, Prune. I missed Gabrielle’s voice the minute I finished her riveting memoir Blood, Bones and Butter and have wanted her recipes ever since I saw Prune’s earliest menus. Even though I’ve enjoyed many books this year, I’m listing only those I really use (and use often). As I’m usually testing recipes and cooking my own dishes, it says something for a book if it stays on the kitchen counter nearly all of the time. 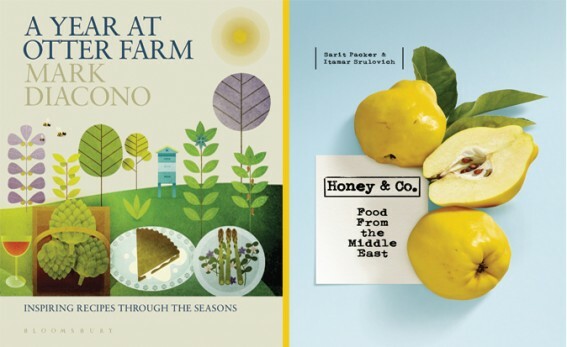 Of course cookbooks aren’t just for cooking from – in fact they’re a lot more than sets of recipes – so a couple of these books have lain on the floor beside my bed, too, or been stuffed into a canvas bag as I left the house to be read on a plane or a train. It will be obvious which ones were loved that much. This book follows a year in the life of Mark Diacono, a gardener (and former head gardener at Hugh Fearnley-Whittingstall’s River Cottage) as he and his wife transform a small holding in Devon and try to grow everything from the almost-forgotten (sorbs, borage and mulberries) to the familiar and everyday. And I can tell you – ta dah – that this is my book of the year. Seldom do illustrated books come together in a whole. There can be great recipes with little or no narrative and a design that doesn’t reflect the author’s approach or personality. Equally, there are books that really do say something visually but have lousy recipes. And some of my favourite books are incredibly well-written but I’ve never cooked anything from them at all. Very occasionally you find a book where each facet – the writing, the photographs, the design, the recipes – have come together in a way that makes complete sense, where you can feel the author’s presence and personality in every aspect of it. That is the case here. The writing is personal, intelligent, funny, and draws you in; the photographs – taken by Mark himself – have a delicate other-worldly quality, while the recipes have an identity all of their own. Give me a list of dishes culled from a mixture of books and I could probably spot Mark Diacono’s. 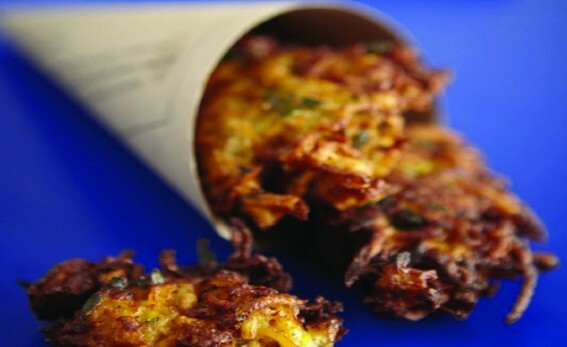 They’re fresh and clean and rather feminine, in fact the only other cook he seems to have a lot in common with – as she also has a poetic touch – is Skye Gyngell. 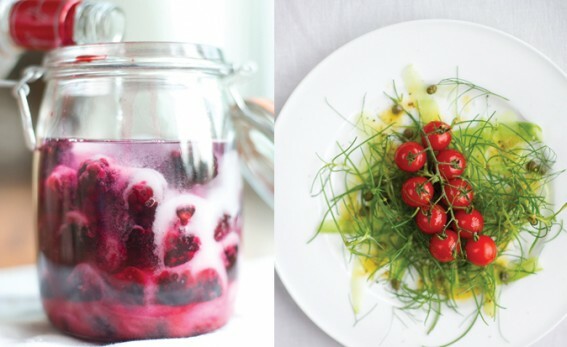 Don’t you want to cook all this: beetroot with labneh, hazelnuts, parsley and elderflower dressing; loin of lamb with lavender and thyme; curried squash and mussel soup; blackcurrant leaf sorbet; sticky medlar and toffee pudding….? I do. In case you’re inclined to dismiss A Year at Otter Farm as being suitable only for gardeners, let me tell you that I kill any plant except rosemary. I neither have the time nor the patience for gardening, but still got a great deal out of this book. There’s plenty of horticultural information but it’s woven through the stories and the recipes so you just take it as part of Mark’s adventure, not as instructions. Anyway, even if you don’t want to grow your own produce it’s good to know more about the fruit and vegetables you use. A lot of paper has been devoted – both in books and magazines – to extolling the kind of life portrayed here, but it’s mostly conveyed by a photograph of fallen apples and a couple of seed boxes. There is no such pretence in A Year at Otter Farm. This food is real and unusual and has been photographed and cooked by someone who really has a feel for – and a love of – produce. Mark didn’t design the cover – it’s about the only thing he didn’t do – but Bloomsbury managed to give the book the right one (it’s kind of ‘Orla Kiely does gardens’). It really does convey what you will find – one man’s happy modern rural life – within its pages. There are no disaster stories – or at least when things go wrong the problems are overcome – so it may annoy some who think that taking on a smallholding must surely be tougher than this. All I can say is that Mark knew a lot about his subject before he started. He is also a ‘glass half-full’ man, which is probably a prerequisite for this kind of project. The book hasn’t made me want to rush out and find a smallholding myself – I’m far too lazy, and I know my limits – but it did make me want to cook, and it also made me look at all the fruit and vegetables that come into my kitchen with new eyes. Now, where can I get my hands on some sorbs…..? Everybody who visits Honey & Co, a diminutive mostly Middle Eastern restaurant near Warren Street tube station, falls in love with the food and the atmosphere created by Itamar Srulovich and Sarit Packer. They’re an incredibly generous and hospitable couple and the place overflows with good will. 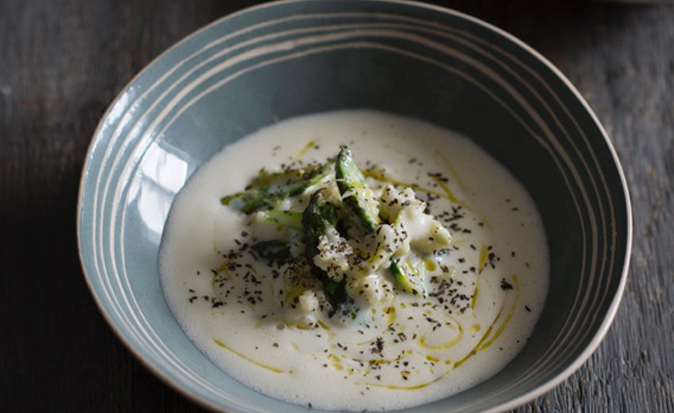 The dishes are all the things we have come to love about Middle Eastern food: fragrant, unusual, decorative and (apart from the puddings) healthy. The book of the restaurant was one of the most talked-about signings of last year. Everyone wanted to be able to create the Honey & Co buzz at home and, indeed, you want to cook every recipe in this book. 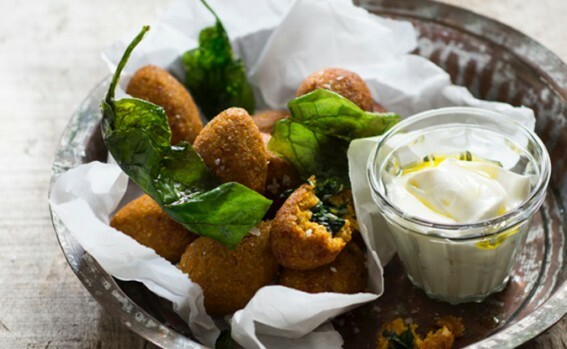 Middle Eastern food has always had – for me anyway – a kind of magic, and somehow Sarit and Itamar have managed to bring that even more to the fore. It’s as if they had pulled together some of the best recipes from the area and set them in sunlight. 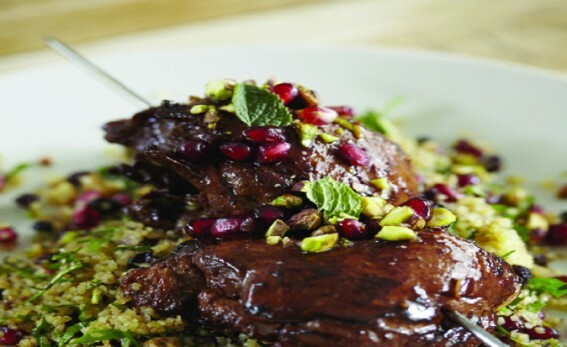 There’s a lightness and a brightness running through this book – cured sea bream with pomegranate and cumin is one of my favourite recipes – though there’s also some solid winter fare: ox cheeks with quince and bay, for instance. The food is, for the most part, easy to cook, too (chicken with apricots and mint and fish with grapes, cucumber and yogurt are eminently doable, even on a weeknight). But it isn’t just the recipes that I cherish here. It’s the voice and the spirit. The head notes to the recipes are not just about food, but about their staff (the waitress who was always turning up with love bites), their travels before they married (‘we found a little hut of a restaurant… well not so much a restaurant as a home with a lot of tables in the living room’), and it is all so human and warm. Itamar and Sarit both love food, they love each other, they love the restaurant they have created, the people who work there and their customers. And they have managed to tell their story, make you want to eat their food, and get a real feel for what makes them excited. You don’t so much get a cookbook, in fact, as a take on a life that has food and hospitality at its heart. Saltyard, the publishers, must be congratulated for not pushing out the ‘same old same old’ when it comes to the design. There are no luscious pomegranates on a jewel-coloured cover, instead a of modern, hand-made feel that perfectly reflects the restaurant. It’s best not to read the recipes late in the evening or you’ll go to bed feeling hungry, everything is desirable and do-able. It’s Indian food, but Meera has stamped her own personality on it, inventing and tweaking. The recipes are fairly short – you won’t spend half an hour getting all the spices together before cooking (the most off-putting thing about Indian cooking if you’re not used to it) – and there are some good Indian versions of food we find familiar (roast chicken given a simple Indian treatment, for example). Sometimes the titles just make you salivate: fire-bellied garlic and chilli chutney anyone? Made in India also shows what a good publisher can do. 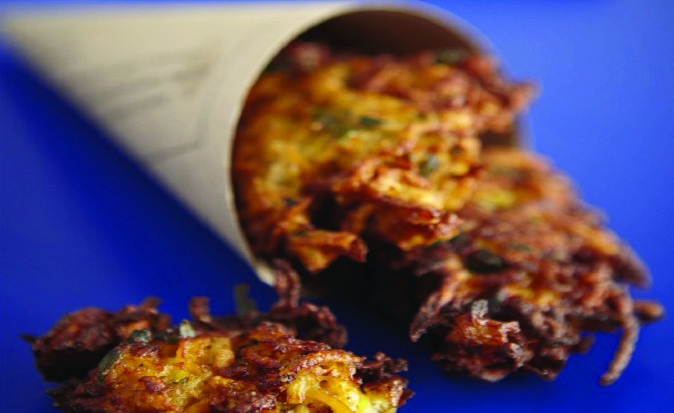 This is a wonderful set of recipes but, in the wrong hands, the material would have been lost. It isn’t the first book that’s been published on Indian food cooked in a British kitchen but they’ve got the title, the feel and the packaging just right. 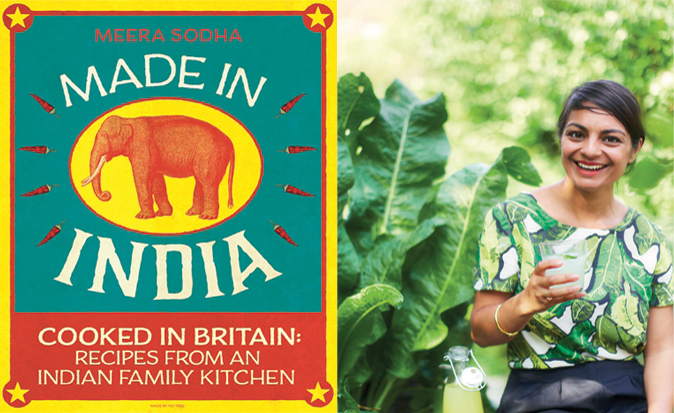 ‘Made in India, Cooked in Britain’ is perfect – that’s exactly what it is – and the cover is genius. I’ll cook from this for years to come. People should have been shouting from the rooftops about this book, but it seemed to slip under the radar. It came out quite late in the autumn – in November – and, with many big name books already on the scene, seemed to be eclipsed by the competition. 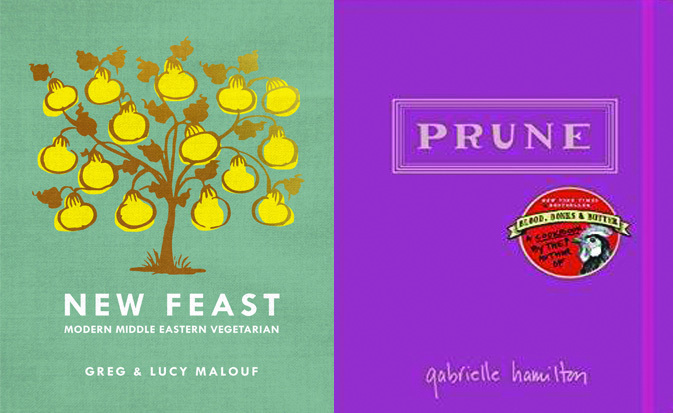 I have every book that Greg and Lucy Malouf have written and although their other titles are sumptuous (Turquoise, Saraban and Saha among them), I find them rather overwhelming. The mixture of gorgeous travel photography and food shots makes the experience of reading them a bit like eating too much Christmas pudding. There is nothing flawed about them, somehow not enough humanity. Some might even call them coffee table books. But the Malouf’s recipes are always wonderful: inspiring, surprising, pulsating with flavour. Their food is mostly Middle Eastern, but they do their own thing, renewing, inventing and modernising. New Feast is different to most of their other books as it doesn’t chart a journey and isn’t full of travel photography, it simply offers Middle Eastern-inspired vegetarian food. It is understated and this, for me, makes it a better book than any of their others. There is more of a sense of them – and their distinctive approach to food – without the clutter of travel photography. The paper is lovely, the illustrations charming, and the cover is quite magical. And the food? Well, I want to cook everything they offer. There are none of the old stalwarts such as tzatziki and houmous – we hardly need those again – but lots of new workings: think guacamole with preserved lemon, an aubergine pie with pimento sugar which is a take on bisteeya, baby carrot tagine with yogurt and honeyed pine nuts. I’ve started to cook my way through it, and I don’t expect to stop. This just arrived recently so I haven’t had loads of time to try out many dishes – and a few American friends have been disappointed (they’re in the minority, though) in the recipes – but there is more here than recipes. I was hoping for long head notes and a meaty intro (I loved Hamilton’s memoir), but this book is short on culinary meanderings and long on staccato-type instruction, as if you were a junior in Hamilton’s kitchen while she licks you into shape. This is achieved by an abundance of margin notes – in Hamilton’s handwriting – warning you what to look out for and what to do with care. Not all the notes are useful to the home cook but that doesn’t matter, as what you get is a sense of how a restaurant kitchen is run, and that’s rare. I’ll be working my way through it. I have recommended this book to everyone and even forced copies of it on some. It came out in paperback at the beginning of the year and for ages I looked at it on the shelf of my local bookshop and passed on by. Philosophers have written about food before and, as they aren’t noted for their greed or delight in pleasure, not entirely successfully. They’re just not that into food. Wittgenstein, for instance, was made fun of for eating the same meal (Swiss cheese and rye bread) the entire time he stayed with John Maynard Keynes when he visited him in England. But I bought Baggini’s book and was impressed by its accessibility and the honesty with which he approaches some of the most pertinent questions in food (both political and personal) today. They are the things that I struggle with all of the time: localism, globalization, food miles, diets, supermarkets, humane farming, the pleasure of routine in the kitchen, the ridiculous emphasis on originality in restaurant cooking. In many of the essays here – such as the one on whether it is always better to choose the artisanal and the hand-made over the mass-produced – he makes you examine your thinking and be honest about the prejudices you might harbour (or your own lack of knowledge). Worried about air miles? You won’t be eating New Zealand butter then. Except that Kiwi butter, it turns out, is produced by methods that emit less than half the carbon dioxide of butter produced in the UK… and that includes the transport to get it here. On many issues – whether supermarkets are bad, for example – Baggini comes down in the middle, in the grey area that is a rather duller but ultimately a more pragmatic place from which to make things better. His ultimate plea is that we adopt Kant’s ‘dare to know’ approach, that we dare to ask questions, dare to be tough on our own thinking. The recipes at the end of each chapter are a bit redundant, but it’s an enriching and sparky read. Just buy the book and dare to explore. You’ll soon have the margins covered in question and exclamation marks. A lot of the debates surrounding food are hopelessly polarized. It’s easy, if you care about food, to jump on the latest bandwagon and take an uncompromising position. This book convinced me that I needed to be better informed before jumping on the next bandwagon that rolls by. You would think that there were enough blogs out there to satisfy my desire to connect with other food lovers. But few blogs are as well written as this. Christensen is the kind of woman I want to connect with and chat to. I looked forward to spending time with her every evening and on every tube journey during the time I read this. Christensen is actually a novelist but food has been a big part of her life. ‘Of course,’ I hear you say, ‘it’s a big part of everyone’s life. We all eat.’ But for some people food is the thing that rescues them, the thing that helps them get through. That sounds grim and this book doesn’t always make for the happiest reading. Christensen was a child in Berkeley in the early 1960s. Her father, a Marxist lawyer from California, ‘defender of and hero to Black Panthers, rabble-rousing politicos and draft dodgers’ beat her mother, flew into violent rages with the children and never hid his disappointment with his daughter. One of the most moving passages is near the beginning of the book. It describes a scene of motherly love and care – as Christensen’s mother is giving the children breakfast – while her father’s rage literally smashes everything. Christensen’s mother is left crying, in the midst of the breakfast bowls, juxtaposing her constant care – partly given through food and meals – and her father’s inability to love or appreciate what he has. Christensen’s father eventually leaves the family but the cooking shared with her vulnerable mother and sisters becomes a constant, a solace, and a joy. No wonder Christensen finds comfort in the simple home food her mother refers to as ‘blue plate specials’. The book charts changing times as well as Christensen’s life as she au pairs in France, puts up with the chilly and competitive atmosphere (and the brown hippie food) of the Iowa Writers’ Workshop, moves to New York – where she eats everything the Big Apple has to offer – and eventually settles in Maine. Don’t think that this is a misery memoir. There’s light as well as dark and it chronicles a time when social norms changed hugely. It also shows a love of old-fashioned American cooking, something the food-serious are more used to scorning, as well as haute cuisine. This is not the kind of book I usually buy. It’s about spirits and I don’t drink them much, but a tasting that one of the authors conducted at Dartmouth Food Festival lured me… and it was a bit of a revelation. 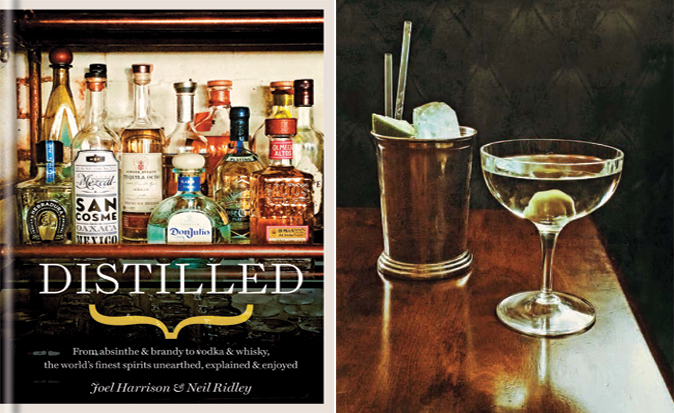 The best thing about the book is probably its youthfulness – it’s not written by ancient whisky experts – and its ability to speak to someone who is fairly new to learning about the whole area of distilled drinks. The design is clear without being dull (it doesn’t look anything like a reference book); the pictures, by Andrew Montgomery and taken on his iPhone, have a saturated quality, as if they’d been overlaid with smudgy oil pastels. The book is just the right length, too, you can easily pick up the salient points, find out who is producing the most interesting new gins, or where you can get a Tasmanian whisky, and get ordering. One can never have too many passions in life, or too many indulgences. Life is best for those who enjoy the small things. With this book you can explore unchartered waters, and add to the things you can look forward to. So far it is leading me down the delightful path of gin devotion… No doubt it would do the same for you.